I’m acquiring a tidy little collection of these lovely “Art of the Novella” books. They shall be key to my discovering, somewhat belatedly, the pillars of modern literature. 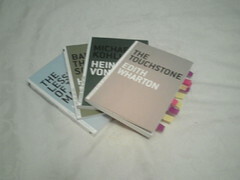 In this household, it’s still ladies first, and so to Edith Wharton’s “The Touchstone”. Published 1900 it has a surprisingly modern theme. Margaret Aubyn is a young widow; also a famous author. She conducts a two-year romance with Stephen Glennard. Unfortunately her passion is not reciprocated. In order to preserve her dignity, she removes herself from him. However, she continues to write many passionate letters to her beloved. When she dies, these letters suddenly acquire a value undreamt of. What is an impoverished Glennard to do? Glennard had never thought himself a hero; but he had been certain that he was incapable of baseness. So are the following mitigating circumstances? The lady is dead. The man is in need of money to marry his beautiful fiancee. The letters will be edited in such a way that no one will ever know he was the original recipient. Determining whether Glennard is truly repentant or only living in fear of public shame is not straightforward. The psychological insight with which Wharton paints Glennard’s character is fascinating – for once he has cheapened himself, it becomes increasingly difficult for him to believe that others in his sphere – including his wife – have not descended to his level. Slow-acting poison. Even if society doesn’t discover him, the man is doomed. A salutary lesson for those who are making money from their confessions/betrayals in this week’s tabloids. And now I’ve read Wharton, I do wonder if the James Hewitts and Paul Burrells of this world (and all those who have recently followed their example) have lived/will live to regret their actions. These look lovely. I’ve really got to stop discovering (new to me) blogs because my wishlist just keeps growing and growing and growing… ! I’m trying to as well but the last four I’ve ordered haven’t arrived! You’re not intercepting them are you, Lizzy? Care to name and shame your supplier? Great post! I have never read anything by Edith Wharton but this looks like a good place to start. If I understand your post Glennard seems like an utterly deplorable character, but on the other hand even though it’s clear that his actions will bring him to a bad end, I can’t honestly say that I wouldn’t have done the same in his position.